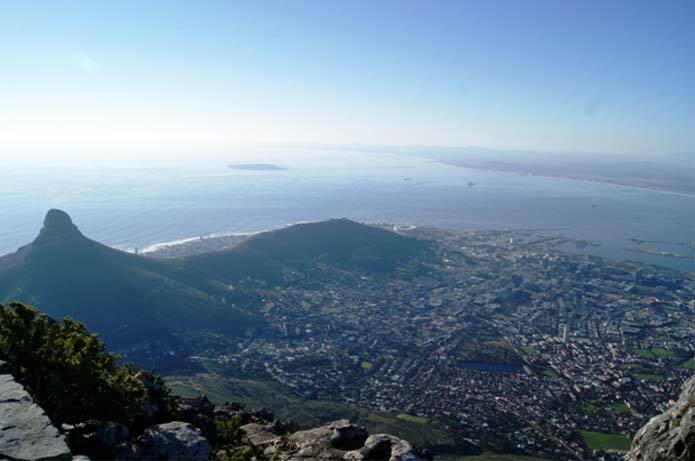 Today we head for Cape Town with the sole aim to go to the top of Table Mountain. The main challenge is the weather and believe me we just had the most perfect weather all 370 km to Cape Town - and to be standing on top of the Mountain in winter not wearing winter clothing alone is a Wow. Clear skies and no wind, just perfect! 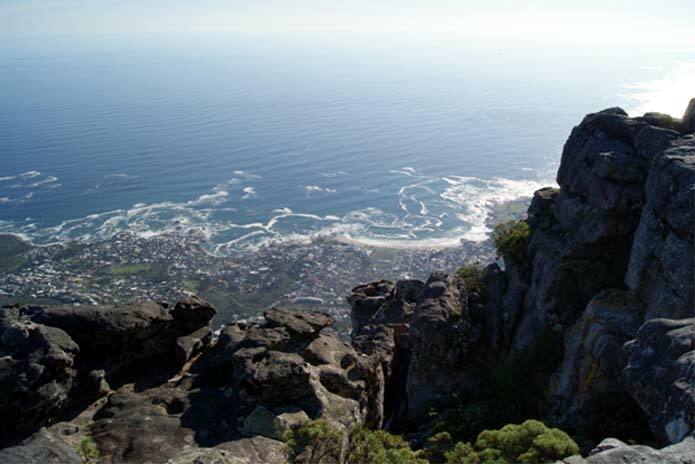 Cape Town's Table Mountain - Adaro Tours Group at the Top! This is our second to last day and knowing the route, I was certain that the tourists would have Wow moments during the day. Our drive out to Hout Bay was spectacular with the sun rising over the mountains in the east, bathing the Cape Flats and the Kirstenbosch side of Table mountain in a golden sun shower that forced us to stop the bus for a photo moment. 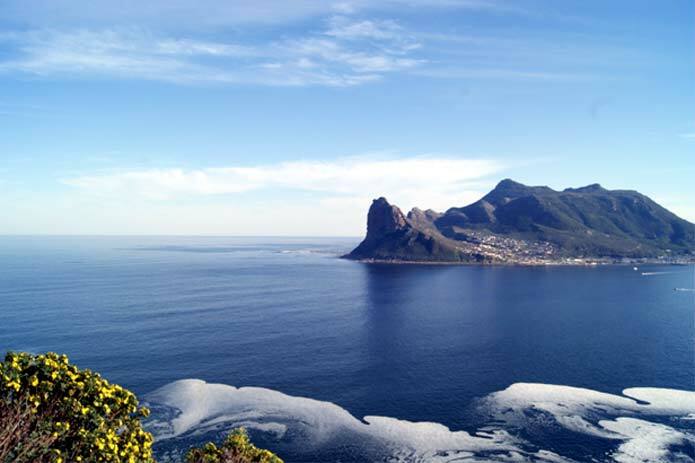 Hout Bay itself also offers fantastic photographic scenery if you are prepared to walk about. Just have a look at those multi-colored reflections in the harbor, pure postcard stuff. 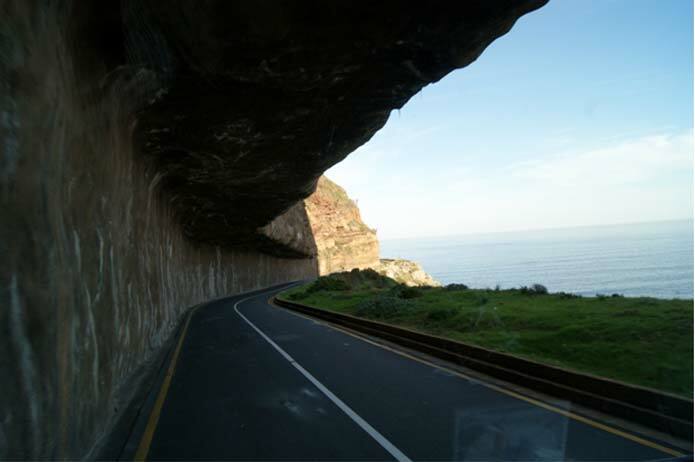 We soon departed for Cape Point National Park via the spectacular Chapman’s Peak drive, a coastal Pass cut from the rock face. 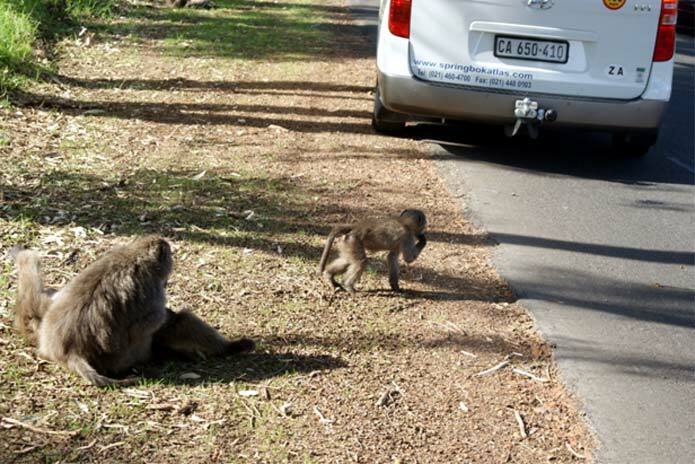 Our fist wildlife, a small troop of baboons have taken over the road, giving us ample time to observe them. 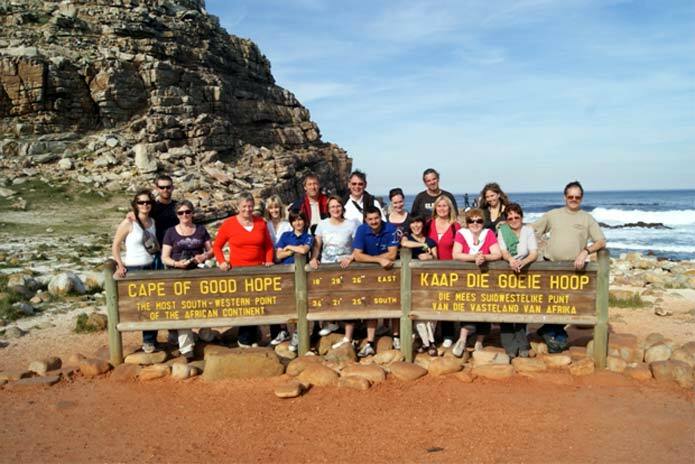 When we arrive at Cape Point, the travel group climb to the top. As one visitor commented, this should be the southern-most tip of Africa with its high cliffs and not Cape Augulhas! Truly Sir Francis Drake was correct - this is the most beautiful cape of them all! After a really good lunch we decided that we will all walk to Cape of Good Hope. The beauty takes your breath away. 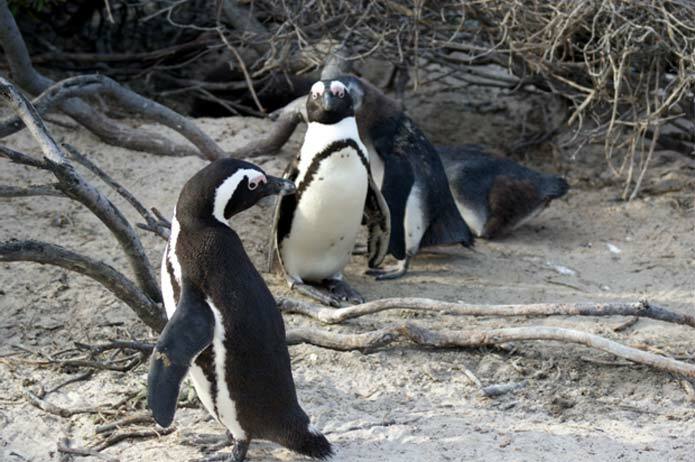 Our journey had to continue towards the Penguin Colony at Boulders Beach near Simon's Town, and after all the oohs, aahs and how beautiful, we followed along the coastline back to our lodge, concluding that with the fine weather, it was just one very fine day with many Wow moments. 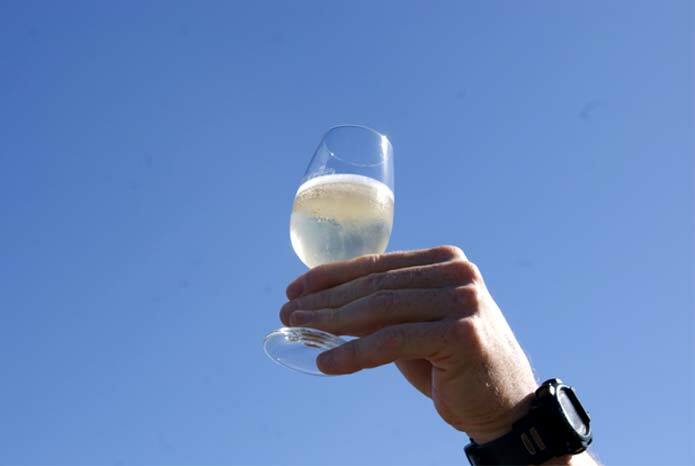 We visited the wine districts of Paarl and Stellenbosch for most of the group it was a scenic drive and an educational moment at the Afrikaans Language Monument, but for two members of the group the last much personalised wine tasting may have been their Wow moment of the whole journey. We raise our glass to the Wow moments we had on tour.